How was your business conceived? It was organic. I was studying textile science and fashion in England, and during my travels I started picking up beads. When I returned to the US for my final year of university, I began making jewelry for friends. I was always interested in fashion design, but never thought of jewelry as being part of that. It was the texture of fabric that I loved so much. The more I learned, the more I fell in love with the diversity and history of beads and cultural adornment. After graduating from university with a marketing of textiles and apparel degree, I started going to college campuses and following the Grateful Dead to sell my work! The entrepreneurial spirit of those parking lots has stuck with me through it all. The ability of it to complement an outfit. The colors of the gemstones themselves, my customers and being in nature. I was born and raised in Chicago, and for many years I said I wanted to move away to a more beautiful place, or closer to awe inspiring nature . . . but then I realized that the people of Chicago and my community will be hard to replace. What do you wish people asked you about your product? They often ask what the individual materials are—I will explain the name of the gemstones, the process of oxidizing silver most frequently. Where can we find more info on your business? Megan Lee Designs offers unique, screen printed items to those looking for high-quality, visually-appealing design that can be worn or displayed. Their items range from clothing to mugs, pillows, and prints. All of their goods are printed by hand in-studio using water-based, environmentally-friendly inks. They strive to create happiness for each of their customers by providing their brand of handmade goodness. They want all of their customers to have an excellent experience through and through. Megan Lee Designs began as a way for Megan to express her more creative side while working a corporate design job. The happiness they inspire in people. Because it's AMAZING (though we live in Westerville, Ohio now). I wish people realized that each piece is printed by hand. We actually do handle every single one. On our website, instagram, and facebook. We love it when our home smells beautiful and so we used to purchase quite a few candles. We happened upon a candle making kit and really fell in love with the process of making candles and blending fragrances. Hearing from our customers about how a certain scent of ours makes them feel at home. The changing seasons, botanicals, and nature in general. We both moved here from other states in our twenties and absolutely love it here. Why don’t you use dyes? The reason is that we love the natural look of soy wax and dyes can sometimes alter the scent of the fragrance. I was first introduced to letterpress printing while earning my BFA at San Francisco Art Institute. Steel Petal Press was born when I designed and printed greeting cards for personal use to send to friends while still in grad school working towards my MFA. I started selling the cards at a few local shops, and the company took off from there. We now have three presses, four employees and an intern. Our cards are carried in over 200 stores across the country including Paper Source. At Steel Petal Press we believe that beauty and humor bring joy to the world. We love creating products that help people celebrate and connect through life’s important moments. Mostly I love hearing customers laughing when they walk in the door, or notes from people saying my card was THE PERFECT card for a specific occassion. I am inspired by humanity, connection, friendships, relationships, laughter, beautiful type, harmonious design, and white spaces. My ideas come from things I would want to communicate myself, and those ideas and phrases become the basis of my greeting card ideas. I moved to Chicago from San Francisco for an MFA program in Book and Paper Art. I stayed in Chicago for the urban atmosphere, affordable rents (compared to the coasts), and DIY / Crafty vibe. Chicago is one of the former epicenters of the printing world, so there's lots of access to great knowledge, community, and supplies. I wish people had a better understanding of the labor involved. We print each card by hand, fold it with an envelope and slip it into a sleeve all by hand. There's a lot of care put into creating each card that can be overlooked. Hmmm the long answer or the short answer? I guess I'll go with long, haha! I used to be an accountant for many years. The grind of accounting was too much to bear and I needed a big change. I went back to school for interior design and got a job in the field. But this "big change" also came with a big change in my income, so to supplement it, I started making jewelry and selling at art fairs. I always loved fashion and accessories, so it was a natural fit for me. I love that I can drill holes in my product wherever I need to. Because of that, I am always creating new designs and never seem to get bored with this medium. Often I am inspired by my own wardrobe—I will get a new outfit and realize I don’t have a good necklace to wear with it! I can customize the length, size and colors to match any outfit. I grew up in a small town in Michigan and Chicago was always this "magical big city" that everyone wanted to move to. It took me quite a while, but I finally moved here in 1999 and have stayed ever since. Oh wow, well, they already ask me everything! I will say that at times, I overhear a shopper say "oh this is enamel" or "this is just plastic." I guess in those situations, I wish they would ask me before blurting out incorrect information. But it doesn't happen too often. On my website www.veronicarileymartens.etsy.com Or visit me at a retail show! Nancy and Andy operate a 2-person small batch production pottery studio in the Ravenswood Industrial Corridor of Chicago. We had a lot of discussions about jumping into it. I (Nancy) quit my job at Paper Source’s warehouse first, then after a couple of months Andy quit being an electrical contractor. So not a lot of hemming & hawing! We’d already had one (successful) small local church craft fair under our belt, so that pretty much sealed the deal. We’re pretty dang proud of our ware, I have to say. The colors, the prints, the durability–it makes it easy for us to tell people that yes, we make things that can last—you know, as long as you don’t drop them of course! Our kid! For many of the prints, it’s our kid. The rest is a mélange of online market research, requests from customers, and whatever perceived needs we feel need to be filled—yeah, like, who doesn’t WANT a happy tater tot on a spoon rest? I (Nancy) am from here, spent my youth in Pilsen and La Villita, then moved north a bit—and I plan on dying here, lol! Andy is from WI, and he really enjoys the people, the places, and all of the things. And really, there’s a great heartiness to this Midwestern city that we love. Honestly, use and care. I know we should print something out that states it can indeed go in the dishwasher no problem, but most people just assume because it’s handmade, it’s going to lose its gloss, or color, or that even the print will come off. It won’t people, because we’re professionals. Instagram! Love Instagram. Visuals help us show people curious about our work peeks at process and things like new places that have our work, or restocks at favorite places. Easier to digest I guess you can say? And you can always count on folks tagging you for in-action shots of your ware that you can share! Check out Circa Ceramics on Instagram, Facebook, Etsy, and their website. It's that time of year again for the summer fun to begin. I'm kicking my schedule off with the Wells Street Art Fair. This year I'll be stationed around the same location as previous years. I look forward to seeing familiar faces and meeting new ones. Here's to a beautiful summer ahead!!! Please watch for my pop up truck around the city. You can keep tabs on the location through Twitter, Facebook and Instagram @bystellalily. I can't even begin to express my happiness for the Cubbies World Series Win. So lucky to have had this happen "in MY lifetime". I am sharing my photo of the marquee which says it all. So many people have been coming to Chicago just to get this shot. I hope you enjoy my rendering of this historic event. Now is the time to think of holiday shopping. Please keep my work in mind when you're thinking of that special gift. Also, The One Of A Kind show is right around the corner. If you would like free tickets just get on my mailing list and I'll send them to you and a friend. Be kind to one another and hopefully I'll see you this holiday season. I want to give a big thank you to the people of Rogers Park and the Glenwood Avenue Arts Fest. Everyone was so positive about the mobile art truck and the curated selection of handmade art by local artists. Other than having a head cold, I had a wonderful time and saw a lot of my neighbors and some friends I hadn't seen in awhile. The weather was especially nice on Sunday and the crowds reflected that. The Glenwood Ave Arts Fest is well run by volunteers and it was such a pleasure to be a part of the event. Thank you for coming by and shopping local! Heading to Minneapolis tomorrow for the Uptown Art Fair. My booth # is 202 on Hennipen. Below I'm going to list what I have coming up. August 5,6,7..................................Uptown Art Fair...............................Minneapolis, MN. Sept. 4,5.........................................Art Fair on the Square...................Lake Forest, IL. The Mobile Truck will be traveling the downtown area and neighborhoods in between shows. Watch for updates on Facebook and twitter. I'm offering free shipping this year. Normally, I only do that at shows when I've run out of something but this year I'm feeling the Holiday spirit. I'll add more images in the coming weeks for you to browse. Many are from my trip to Paris and more Chicago images. Enjoy! Can't resist adding these two new images to the collection. It has been so exciting watching the Cubs play and WIN! Just an aside...my stomach hasn't calmed down yet and I have no fingernails left. Worth it!!!! I'm going to make my hand transfer marble coasters this weekend just in time for the National League Championship Series. Of course, the Cubs are going to take it. If you're interested in ordering some for a friend you can either email me direct or place an order online (http://www.stellalily.com/tiles/set-of-four-coasters) and select the discounted set of four. These will also be available at the OOAK show in December but remember to come early for the best selection. Good news-bad news. Which one first? Let's start with the good. I've been driving my mobile pop-up truck to Daley Plaza and participating in the Food Truck Fest this fall. I have two more dates: October 21st and October 28th from 11:00 to 2:00. It's been a good experience and I've met many wonderful people working in the nearby downtown offices. Now the bad news...the City still has not given me a proper license to sell from the truck on a regular basis. We have been back and forth on the so called issues and I've made many trips to City Hall. In the beginning, I was told a regular peddler's license would be sufficient but when I was ready to roll that all changed. Needless to say this has been frustrating but I'm continuing to park where I can and make this a viable extension of my business. I truly appreciate your support and look forward to driving and opening my doors in your neighborhood. It's been a very busy month and we only have a few days left of June to enjoy. Between you and me, June is my favorite month of the year. We've been having very rainy weather so far. Nice for all the trees and plants but not so nice for summer art fairs. That said, I totally forgot to post my schedule. I've already been in the 57th Hyde Park show and the Old Town Wells Art Fest. Both shows were extremely busy and wiped me out of inventory. That's a good thing but now I'm playing catch up. I will be at the Fountain Square show this weekend in Evanston (booth #50) and if you want the best pick I suggest you come early. Also, the truck will be rolling out after Fountain Square. I'm looking forward to seeing how this is all going to work. Some exciting news about the truck is that it will be in the Taste of Chicago this year. 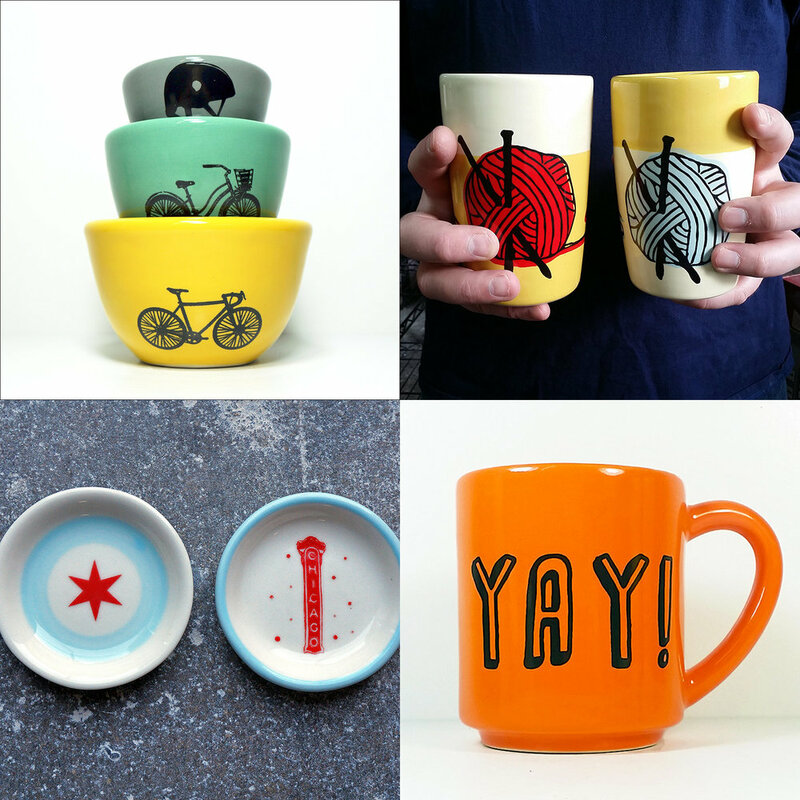 There is a special section devoted to Chicago Made items. Come by and check it out!!! 6/27, 6/28 Fountain Square....................................Evanston, IL. 7/15 - 7/18 Ann Arbor Art Fair...............................Michigan (I'm on Liberty). 8/29, 8/30 Bucktown Arts Fest..............................Chicago, IL. The truck was in the shop while I was on vacation. Picked it up this weekend and I think it turned out great!!!! Loving the big graphics and eye catching colors. Thank you Mr. Lou for the design. Still working on the inside but will hopefully have it ready in two weeks for its debut. I'm in the process of gathering work from various talented artists. I will post pictures of some of the things you'll see on the truck in the first month. I want to keep the inventory rotating with new items so if you see it today. . . it will probably be gone tomorrow. This is an exciting new adventure. Thanks for all your support. I'll see you down the road. I am so excited to announce my new venture. It's the StellaLily Mobile Pop Up Shop!!!! I've been thinking of this for three years and finally decided now is the time to jump in. I figure I only have this one life that I know of and it's never too late to start something new. My bus/van/truck will be traveling around the city and burbs offering my photo items plus many other art pieces like ceramics, prints, jewelry, wearables and household items by midwest artists. This is just way too cool! Now you won't have to wait for an art fair to buy that one special gift for you or a friend. You'll be able to follow me on twitter or go to the website to find where I'll be located. I will post about building the inside and what the outside of the truck will finally look like. It's going to be fun watching 'this monster' take form. The summer show schedule is in the works. I'm still going to be doing some shows but not as many as before. The plan is to use the truck more often as my business and fewer shows. Now, what I need from you is any suggestions of things you'd like to see (like certain artist's work), where you'd like to see the truck or if you have any ideas for maybe a block party or trunk show. Endless possibilities! !